Thousands of parents and carers are suffering physical and verbal attacks by their children, according to new research published today. The assaults are close-kept family secrets and most adults are too embarrassed or ashamed to report them or to seek help. Many live in fear of their child. Studies show that 10 per cent of families in the USA suffer child-to-parent-violence (CPV) and new research led by the University of Brighton has shown families in England and other parts of Europe are living with the same abuse. 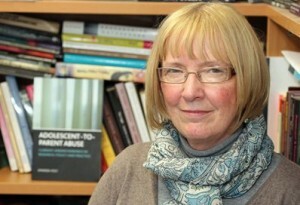 The university, in partnership with Brighton and Hove City Council, and European partners was awarded €751,000 (£641,000) in 2013 to study this emerging problem which involves both young teenage boys and girls using physical or psychological abuse to gain power, usually over their mothers. Along with the University of Brighton, the multi-agency research group included Brighton & Hove City Council, the National University of Ireland (Galway), Universitat de Valencia in Spain, the National Association XXI Century Rhodopa Mountain Initiative in Bulgaria and Amal Municipality in Sweden. The action research assessed the effectiveness of two existing intervention models ‘Break4Change’ and ‘Non Violent Resistance’ from a gendered perspective across five European countries – Bulgaria, Ireland, Spain, Sweden and England. Break4Change is a specialist CPV intervention programme in Brighton and Hove which has parallel groups for parents and young people. It helps children to share, to learn and investigate their reactions and responses. They learn techniques to cope better with emotions and emotional literacy. Nonviolent Resistance (NVR) is being run in Ireland as an approach for parents who are trying to respond to CPV and offers a one to one approach. EU policy development to include CPV in child protection, domestic violence and child maltreatment prevention policy. More data and research to better assess the prevalence of CPV. Training for practitioners and a network of specialised CPV interventions to enable parents and young people to gain the support they need. The findings have been welcomed by Councillor Sue Shanks, chair of Brighton & Hove City Council’s Children & Young People Committee, who said: “This study has helped ensure effective practice for us in Brighton and Hove through the opportunities to share good practice and evidence based research. Funding for the research came from the European Union under the Daphne III programme and, Dr Wilcox said, the project already has contributed to the protection of children, young people and women against this form of violence. Dr Wilcox added: “This pan-European approach has contributed greatly to the further development of change models and the better understanding of CPV. Mother of two, Jane (not her real name), said: “This all started when my son was 13. It manifested in lots of shouting, smashing things, taking my bag, threatening to break things, threatening behaviour, physical violence, smashing parts of the house and being very out of control. “This just got worse and worse. All the boundaries I had been using before just were not working. There were problems at school and he wasn’t getting the support he needed there. “He started to run away from home and I had to phone the police. This was very tiring, very stressful, very frightening and very worrying for me as a mother and, as a result, I had very low self-esteem. “I was so worn out that I didn’t look after myself properly and it was also affecting my daughter. Other parents who haven’t experienced this don’t understand. You feel so crap at the school gates. “Then a Young Offenders Project worker visited and talked to us about Break4Change and this has since been a major influence. He was straight talking with both of us, and supportive. “My son and I attended the Break4Change programme – I don’t think it would work properly if we hadn’t both gone together. He didn’t feel he was being sent to the programme as the ‘bad boy’ and it showed him that I loved him. Jane said the programme encourages parents to adjust responses, to say no and sticking to it, to not being afraid to call the police, using money initiatives, and choosing the right moment to speak to your child so as to avoid arguments. Family Lives, which offers a confidential helpline service. It can be telephoned free from landlines and most mobiles. Call skype 0808 800 2222 free for information, advice, guidance and support on any aspect of parenting and family life. Opening hours are 7am – midnight. Those needing urgently to speak to someone during the night can be diverted to the Samaritans who are available to offer emotional support. A 24 hour national domestic violence helpline, Skype phone 0808 2000 247. Rise, a charity which supports women, children, young people and families affected by domestic abuse in Brighton & Hove and across West Sussex. Phone skype 01273 622 822 free. Hear about the innovative Break4change project that is helping parents in Brighton & Hove tackle violence from their children. The audio features an interview with Brighton & Hove City Council Youth Offending Service parenting worker Martyn Stoner and a mother who used the service and now has a much improved relationship with her son. Break4Change was one of the first projects of its kind in Europe and is now providing advice to other countries who are looking to set up something similar. Tagged Break4Change, Carers, Domestic Violence, Families, Social Science, Youth Offending Service. Bookmark the permalink.